This study describes the development process of Kor-Factor, which is a novel composite evaluation index that was developed to promote Korean domestic academic journals. As more data accumulate, the Kor-Factor’s optimization process was modified in an attempt to address possible drawbacks of the original form; the result is presented in this study. 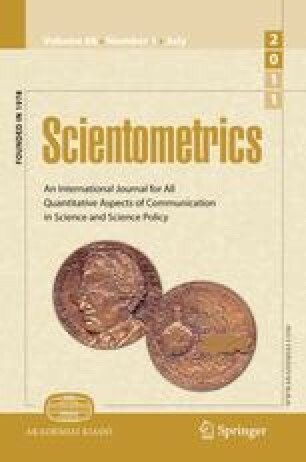 This study compares Kor-Factor with the Impact Factor, which is the most well-known single element evaluation index. We found that Kor-Factor demonstrates a better power of differentiation and a greater capacity to reflect the reputability of key journals. The modified Kor-Factor, which has been developed through an optimization process, reveals a greater power of differentiation than the original Kor-Factor; however, the modified version has less capacity to reflect reputability. The evaluation elements of the modified Kor-Factor are better and are more evenly reflected on the index value than those of the original version. Finally, we propose the establishment of an appropriate data measurement period for the actual application of the index. This paper was supported by Faculty Research Fund, Sungkyunkwan University, 2009. Dong, P., Loh, M., & Mondry, A. (2005). The “impact factor” revisited. Biomedical Digital Libraries, 2(7). doi: 10.1186/1742-5581-2-7. Seglen, P. O. (1997). Why the impact factor of journals should not be used for evaluating research. BMJ, 314(7079):497. Accessed December 20, 2009, from http://www.bmj.com/cgi/content/full/314/7079/497.